SOLD OUT ( no longer in stock ) ENLIGHTENED Original Poster * Lara Dern * HBO 27"'x 40" Rare 2013 Mint New Condition. Large Wall Size measures 27" inches wide by 40" inches high. 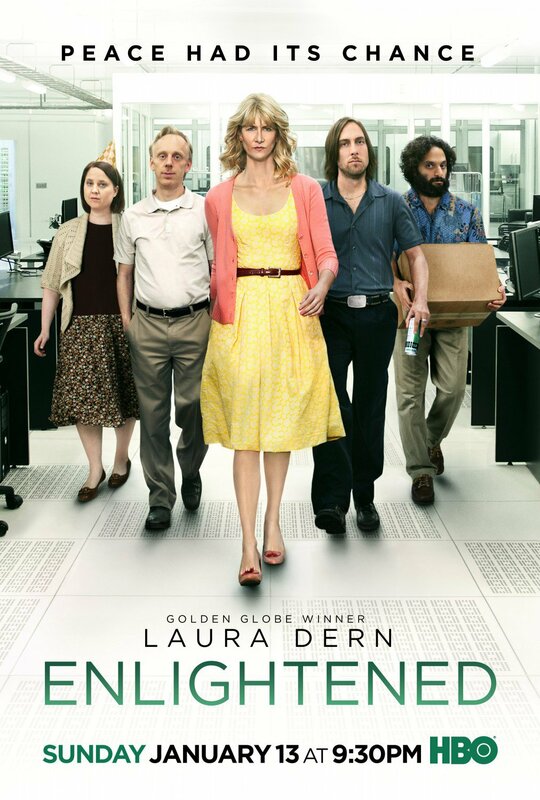 Original Official Advance Release Poster for the January 13, 2013 premiere of the second season of HBO's Original Hit Series " Enlightened ". As signalled by its tagline "About a Woman on the Verge of a Nervous Breakthrough", Enlightened follows the story of Amy Jellicoe, a self-destructive executive, who, after the implosion of her professional life and a subsequent philosophical awakening in rehabilitation, tries to get her life back together.In 2012, Laura Dern won a Golden Globe Award for Best Actress - Television Series Musical or Comedy for her role in the series. The show was nominated for the Golden Globe Award for Best Television Series - Musical or Comedy , and also garnered much critical praise, appearing on several "best of" lists at the end of 2011. This Original Poster is Printed in Brilliant Razor-sharp 6 color production on thick advertising poster stock paper. A great Original Authentic Enlightened Collectors item of a unique original comedy series. Ready for framing , or simply hang as is ~ great for an Apartment or Den , Entertainment Room or Studio. Will be carefully rolled and shipped in a heavy duty tube and shipped Priority Mail with Delivery Confirmation / Tracking. This Poster is in Mint New Condition. Email with any questions before purchasing if you are unsure about something. We ONLY accept Money Orders , Cashiers Checks or U.S. Cash as payment ( we do NOT accept personal checks or online payment at all). Please email about local pick-up , we are located in NYC in Times Square. All International Customers MUST email us before purchasing this item.